The summer is quickly approaching, and that means warmer temperatures and higher levels of humidity. For cigar smokers, these conditions present several challenges, each of which is best addressed through prevention. The first challenge, and arguably the most sinister foe of premium tobacco, is common mold. This white, black, green, and/or blue substance is a fuzzy, smelly cigar-killer. If left untreated, mold can spread through direct contact—or even airborne spores—to ruin your treasured smokes and damage the lining of your humidor. Once you’ve got mold, there are a few measures you can take to minimize the damage. But you’re much better off preventing a mold outbreak from occurring in the first place. To keep your guard up, maintain 65% relative humidity in your humidor and allow your smokes to breathe every so often. Another menacing tobacco enemy that’s more prevalent in the summer is the tobacco beetle. Most cigar enthusiasts shudder at the mere thought of these nasty little critters. If activated by warmth, these loathsome creatures undergo the larva, pupa, and beetle stages over the course of 10 to 12 weeks. After that, they’re beetles for about 14 days, and your humidor becomes their all-you-can-eat buffet. Trust me when I say that prevention is the best policy. Beetle prevention can take a number of forms. The simplest method is to keep the temperature inside your humidor to 65 degrees. This strategy is effective because beetle eggs—which are harmless and (sadly) present on most tobacco leaves when they’re harvested—won’t hatch without temperatures of around 75 degrees. Another way to prevent beetle outbreaks is to freeze your stash of cigars (thereby killing the eggs before they have a chance to hatch). Some cigar enthusiasts freeze every single new cigar they get before adding it to their humidor. For those of us who consider this practice overkill, try freezing only high-risk cigars (such as ones that were shipped during the hot summer months). In either case, follow these steps: Put the cigars in Ziploc freezer bags, seal the bags tightly with as little air as possible inside, place them in a refrigerator for one day, move them to a freezer for three days, place them back in the refrigerator for one day, and then leave them at room temperature for one day. 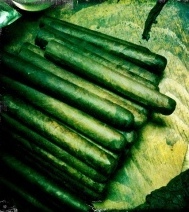 This process of slowly freezing cigars will minimize the stress imposed on the tobacco leaves. Whether you’re working to prevent mold or beetles, please know that your efforts are only as effective as your equipment. The onset of summer—and all the heat and humidity that comes with the season—is a good time to upgrade your thermometer and hygrometer if need be. Thanks for the reminder. Unfortunately you are right that particularly here in Florida where Summer means hot and humid, beetles are a big worry.